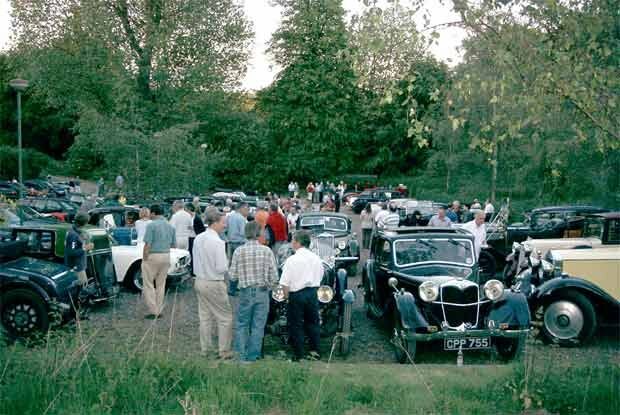 Historically our visit to The Skimmington Castle (4) just off the A25 on the Heath west of Reigate is one of the two best attended evening meetings of the year. The following text is based on the SVVS Magazine report by Chris Cuss, photos by Tony Oakes and Simon Mohacek (hence text and photos may not match!). Photos were taken with very little light so have been artificially lightened to be viewable. Please click on any thumbnail picture below to see the full size picture and please note that the photo may take some 15 seconds to load. To return to the thumbnails please click the Explorer "Back" arrow (top left of the screen). Pictures have been prepared for speed of loading on the web so the definition is lower than a print, and sized to be viewed on an 800 x 600 setup. 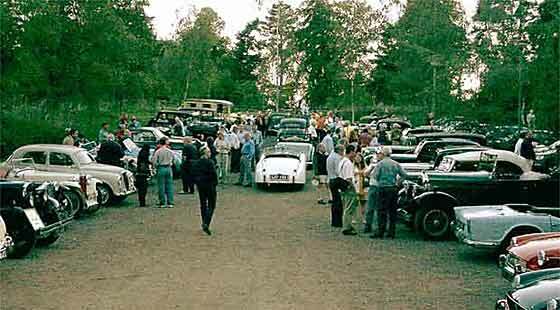 By my reckoning our previous best total at the Skimmington Castle was the 39 cars that I recorded in 1999. 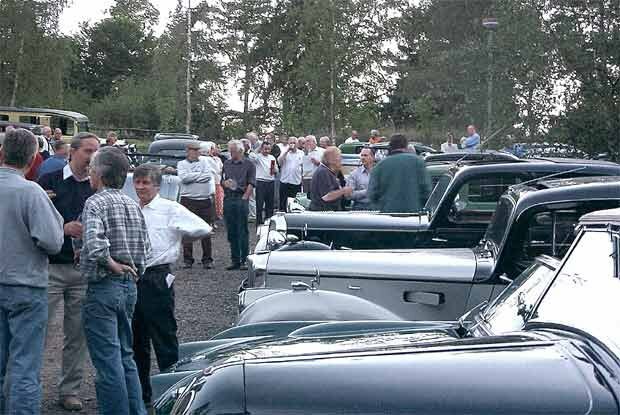 Last year the weather was against us but some 36 vehicles attended. 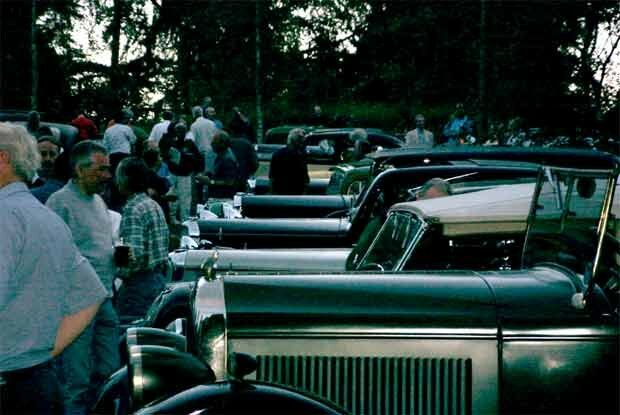 This year the weather could not have been better which certainly brought out an abundance of proper motors. Our jovial landlord at the Skimmy forsook the bar to act as car park attendant for the evening and he counted no less than 57 vehicles into the reserved section. 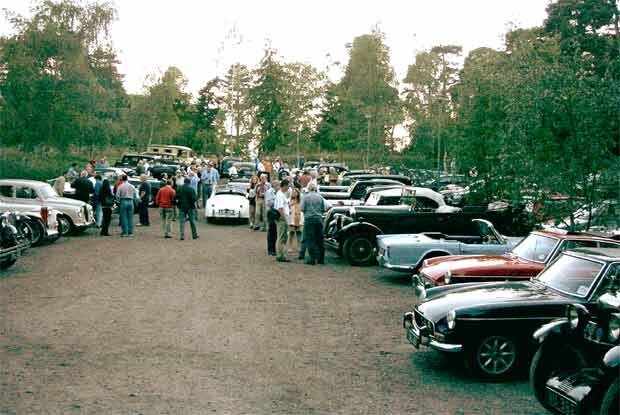 My own list records a few less at 51 as I did not make note of some of the more modern sports cars unless I knew them to belong to our members. 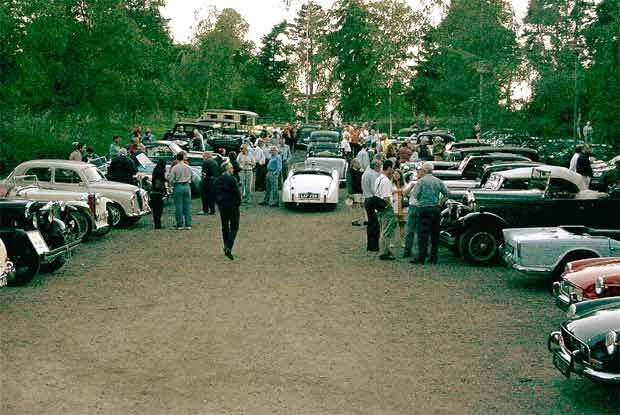 The only way to start with so many cars is to run down my list alphabetically. Four Alvises attended. Chris Geary brought his 1953 TA21, Nigel Walder came in his 1928 12/50 Sports, Tim Harding's 1929 12/50 looked immaculate and Albert Sparrowhawk exercised his 1937 4.3 Special with sports racing body by Albert himself. Desmond Peacock has done a body off restoration on his 1927 Grand Sport Amilcar and it looked superb. Parked next to it for a short time was an equally superb Amilcar Italiana owned for many years by the VSCC Bulletin's recently appointed cruciverbalist Danny Bogroam (anag.) 5.7. 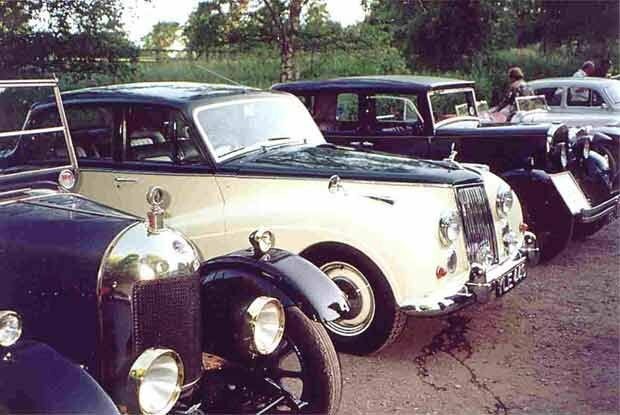 Two Armstrong Siddeleys attended, the 1933 15 h.p. 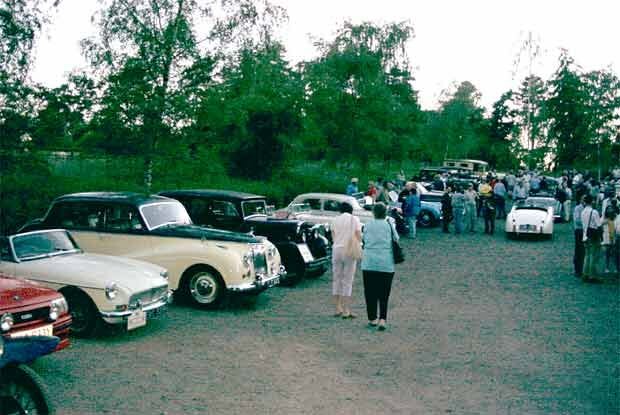 saloon owned by Mike Fay and the 1959 Star Sapphire belonging to David Lilley which we first saw last autumn after its lengthy restoration. Austins were in short supply. I only spotted the 7 Special of Alan Rees. John Sheldrake had only just returned from holiday so came in a modern. Another without a car was Alan Benewith who has been under the weather recently; get well soon Alan, it's not the same without one of your Jowetts present. 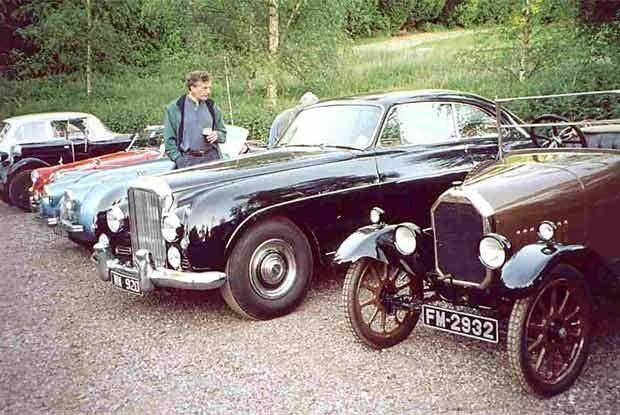 Both Bentleys were post-war. 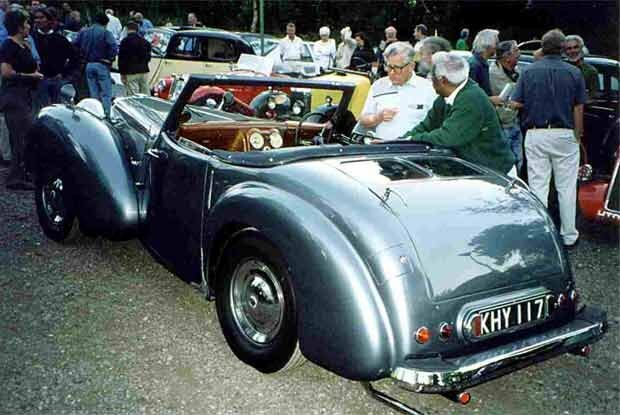 Alan Milbank came with his 1956 S1 Continental and Mike Gorman with his 1950 Mk6 saloon. 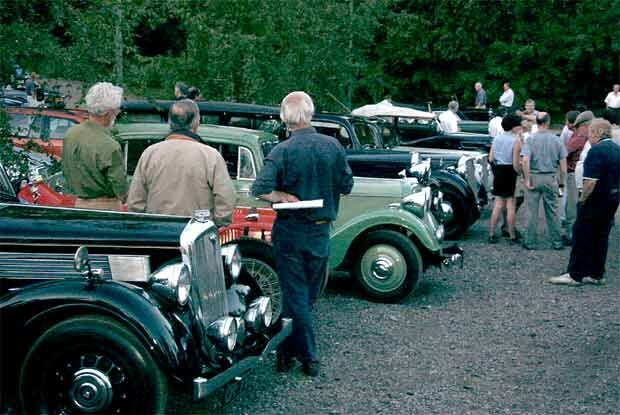 Tony Tester as ever was in his 1926 Chrysler Imperial and Alan Pratt brought his 1935 Crossley Regis. Alan is the member who lives closest to me and yet I never see the car around Cheam. John Mortimer has changed his Model A Ford for a late Model T and has had an interesting winter learning to master the controls. He was one of three members to bring a well-behaved motoring dog. 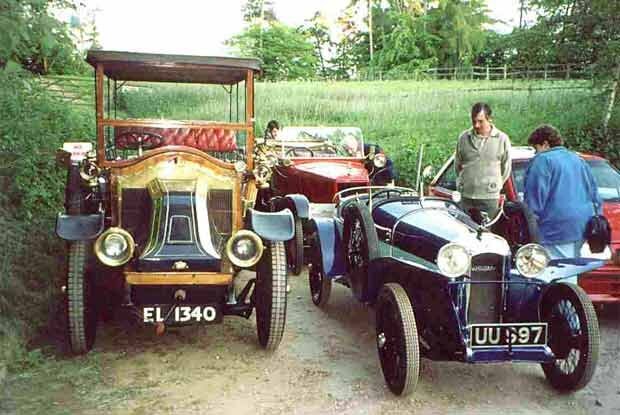 The other Model T belonged to David Smart who has long ceased to be fazed by Henry's quirky design. 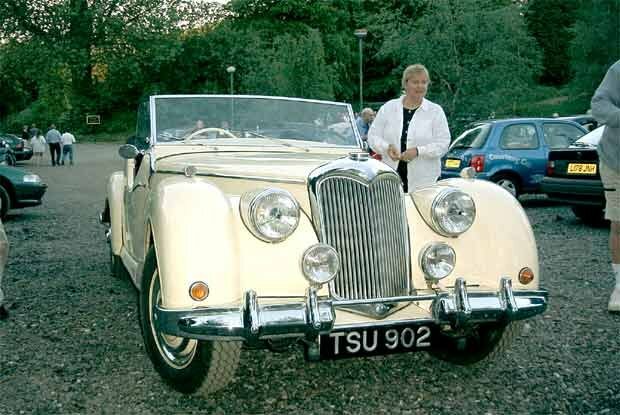 Final Ford was the 1937 7W drophead which came without its accompanying flat hat Mr. Russell bravely baring his barnet. 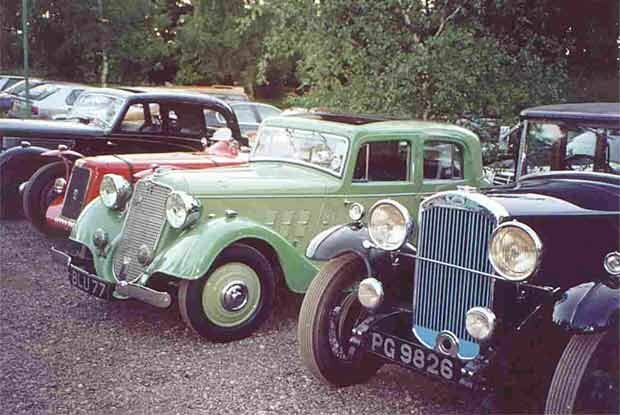 More cars from Coventry in the shape of three Humbers varying in size from the 1924 8 h.p. of John Kirkby via the 1929 16/50 of Gordon Tapping to the 1930 25/70 Snipe of Tony Oakes. 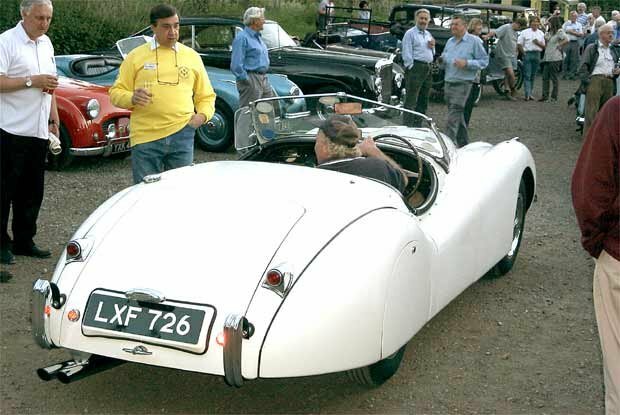 Mike Erroll and Clive Bracey both brought XK120 Jaguars; Mike was also accompanied by his motoring spaniel. 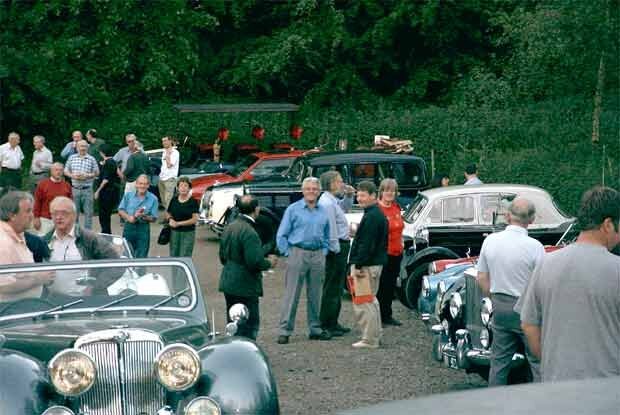 Only one of our two Lancias attended, the Appia saloon owned by Will How. Harry Scott who normally arrives in his Lambda being otherwise engaged navigating his wife's Alfa on a 3000-mile jaunt across Europe following the Danube. Now comes the bit where I always go wrong. We have reached M.G. Colin Mulford's 1954 TF looked immaculate in the evening sunshine. There was a 1946 TC so the floods must have finally receded and Ron Smith brought his 1951 Y saloon. 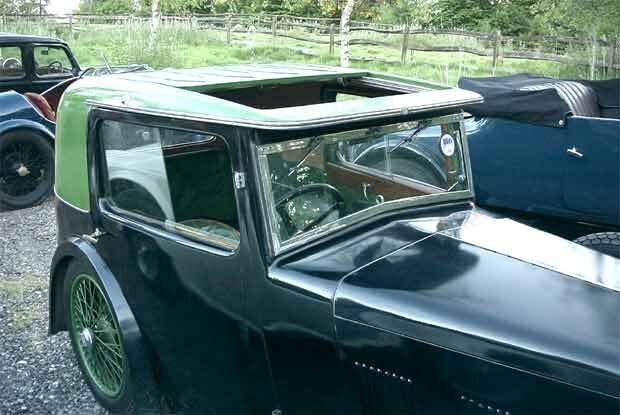 Phil Sowry was passenger in a small sports coupe with glass panels in its sunroof. 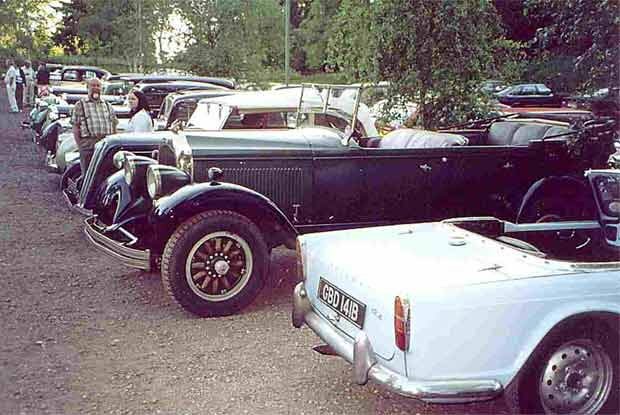 A more knowledgeable member told me he thought it was a 1931 Magnette. 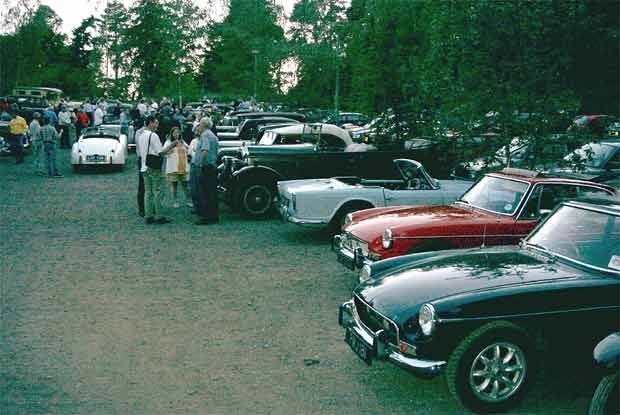 In addition there were several MGB's belonging to visitors. The third motoring dog was guarding the 1925 Bullnosed Morris Oxford belonging to Colin Dawson. 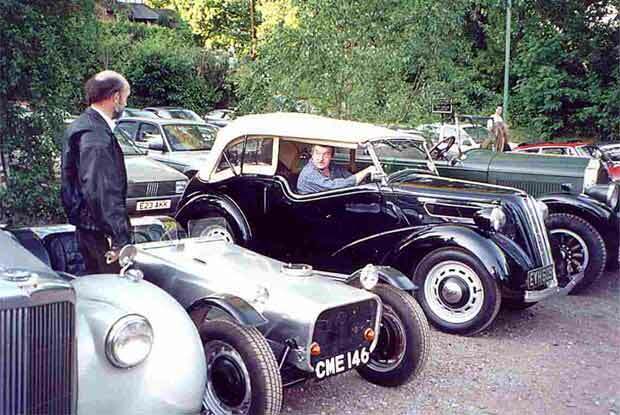 Malcolm Bailey came in his 1934 Minor tourer and Frank Hayter in his 1934 Oxford saloon. 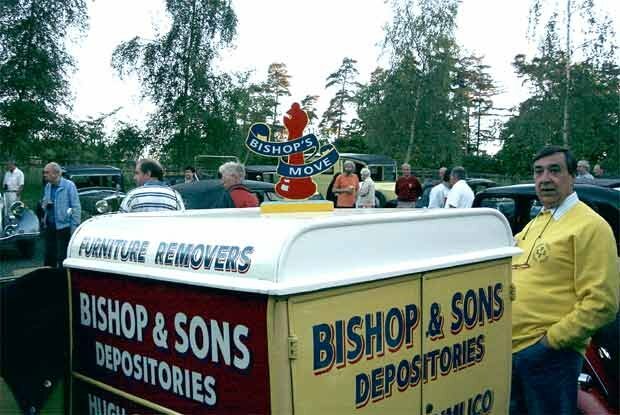 Even I can identify the bright yellow 1925 Cowley traveller's van belonging to Roger Bishop. Another easy one to identify is the Renault charabanc owned by Michael Doughty. 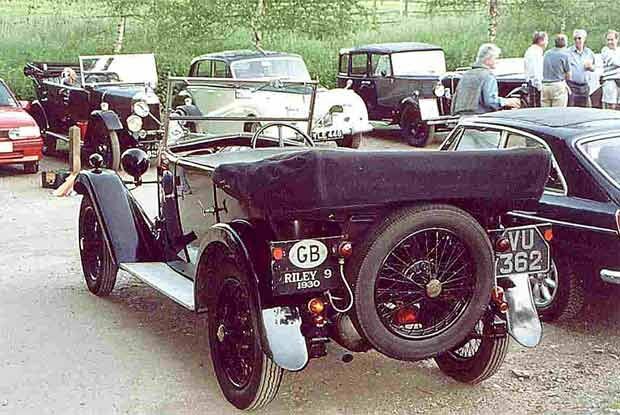 The Riley brigade were all looking in good shape after their jaunt to Cornwall. Vernon Nowell was in his 1936 Kestrel, John Manvers in his 1934 Falcon and Robin Vince in his 1932 Gamecock. Bryan Shepherd came with Robin as he is having the wheels of his Lynx resprayed. 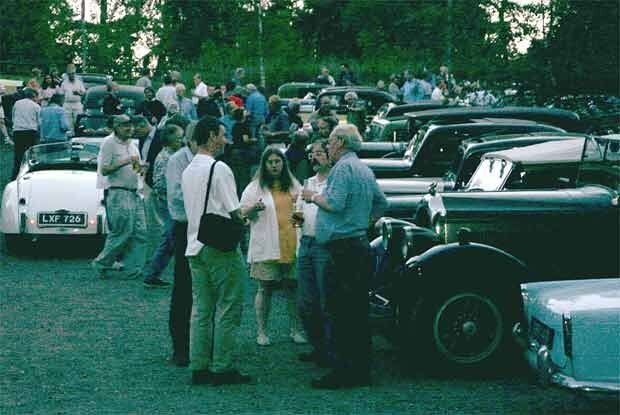 Two-post war Rileys attended. 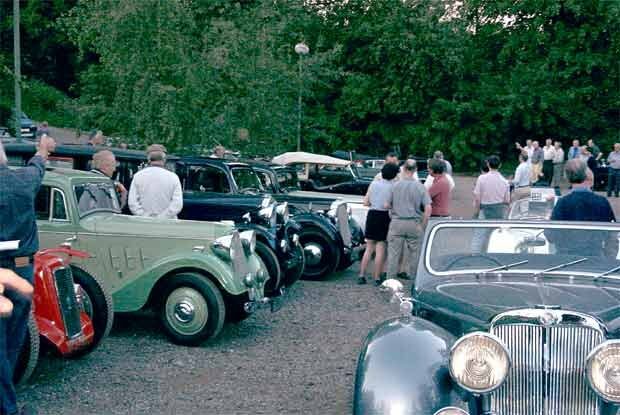 I missed the owner of the RM saloon but managed to speak to Vivian and Jette Landon who came in a very rare RMC drophead coupe. Mr. Bozi Mohacek brought the Rolls and wore his Edenbridge & Oxted yellow sweatshirt that matched Roger Bishop's van. Younger Mohacek was whizzing around with a camera. Trevor Mason came in his 1947 14 h.p. 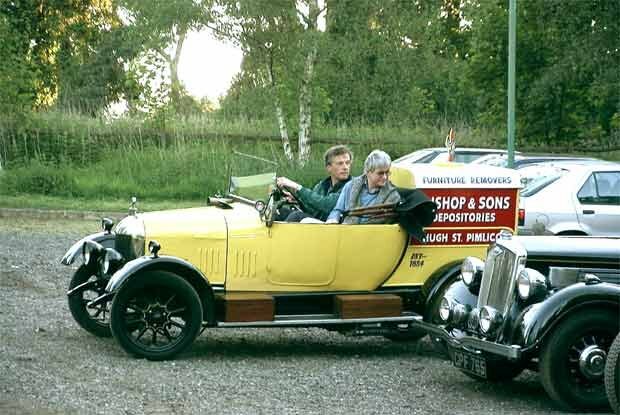 Rover and Graham Martin arrived in his 1931 Standard Big Nine. 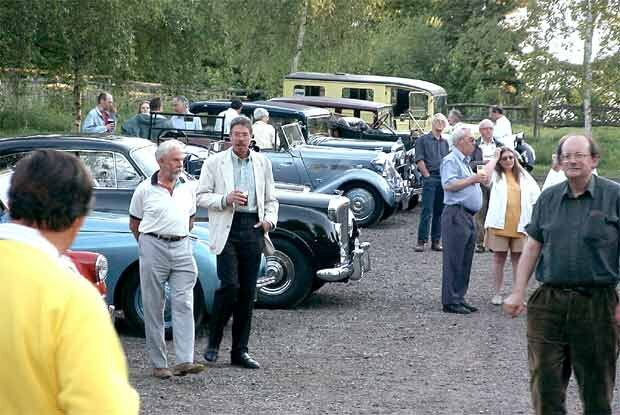 As dusk was falling a well-known Singer appeared and so had to squeeze in with the moderns in the other car park. 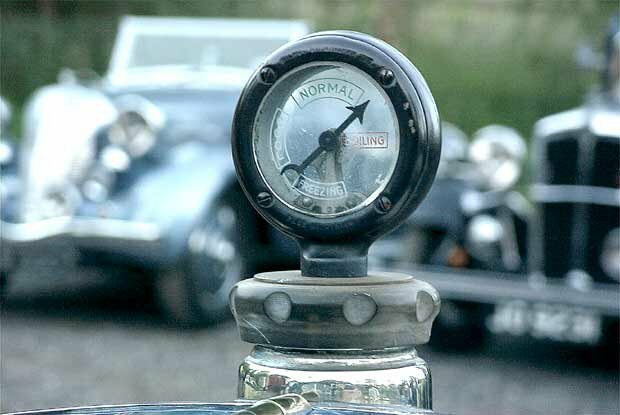 Simon and Jackie Pearce's Stoneleigh has become a year older and is now listed as 1923. As you may have read elsewhere the Tin Tourer broke a crank recently. 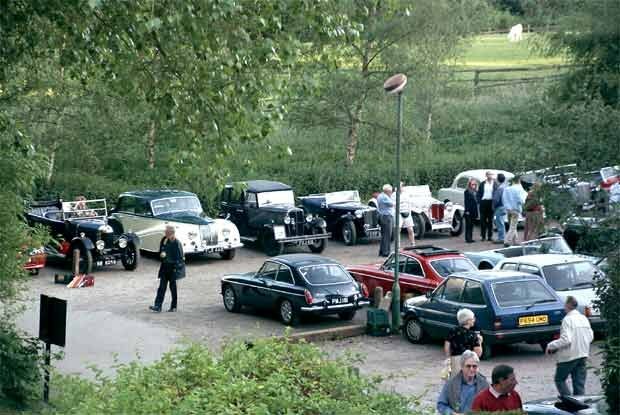 Luckily Brian Lloyd Jacob had a spare engine and the bank holiday weekend was spent affecting a transplant. The job was finally finished on the night before out meeting, the journey to Reigate being something of a trial run. Thankfully all seemed in order. Now I have to try to get my fingernails clean again. 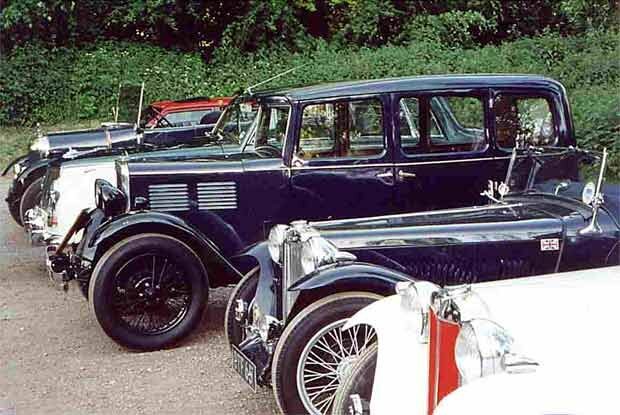 Several cars were in pristine condition having most obviously been subject to a great deal of fettling during the winter. The standard of our kind of cars seems to be getting better each year. One of the advantages of our ageing membership is having both more time and/or money to spend on hobbies. 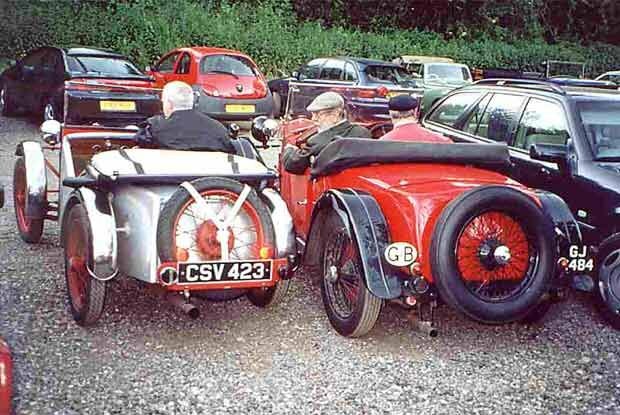 Many of us started with pre-war cars simply as a cheap means of transport and ran them every day. I do not believe this to be true of any but the most dedicated enthusiast anymore.